Summer is waning and almost to an end. Nonetheless, we are still enjoying summer’s bounty while it is still available. 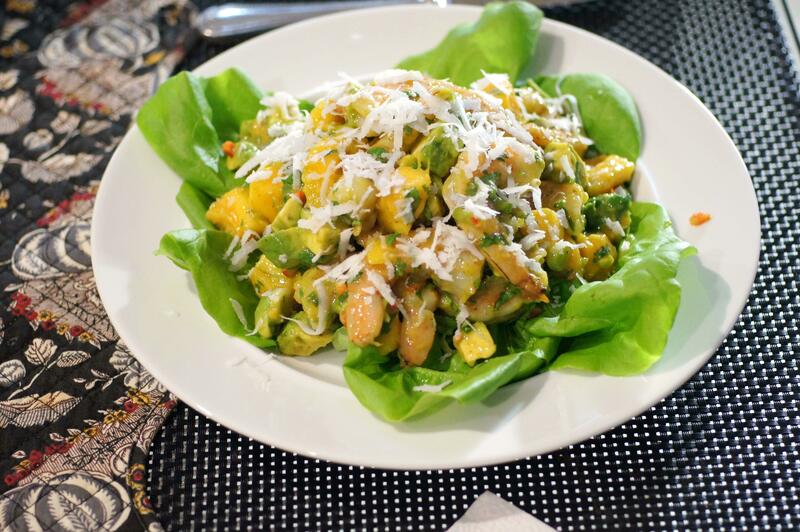 This was a delicious salad full of fresh ingredients with a tropical flair. We are still seeing mangos at the market although the yellow (Atuaflo) mangos are gone. Most of the mangos currently available are Haden mangos. Now, did you know there are over 50 varieties of mangos? There are but you will most likely find one of the six primary varieties of commercially available mangos with each one having a unique flavor and texture. The following is a list of the 6 primary varieties of commercially available mangos and their characteristics. The Atuaflo mango is vibrant yellow in color with a sweet and creamy flavor with a smooth, firm flesh with no fibers. When ripe the skin turns to a deep golden color and small wrinkles appear when fully ripe. 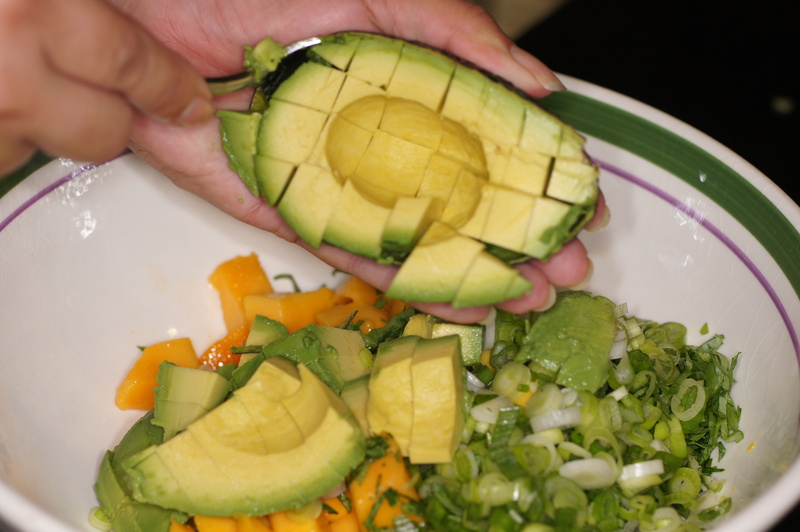 Their peak availability is March to July and Mexico is the primary source for Atuaflo mangoes. The Francis mango grows on small farms throughout Haiti. It has a rich, spicy and sweet flavor with a soft, juicy flesh with fibers and a bright yellow skin with green overtones. When ripe the green overtones diminish and the yellow becomes more golden as it ripens. As with the Atuaflo mango its peak ripeness is May to July. The Haden mango inspired the creation of a large-scale mango industry in South Florida; however, because of the impact of development and hurricanes the Haden mango is now primarily found in Mexico. It has a rich flavor with aromatic overtones and a firm flesh due to fine fibers with bright red color with green and yellow overtones and small white dots. When ripe the green areas of the mango turn to yellow. Peak availability is April and May. 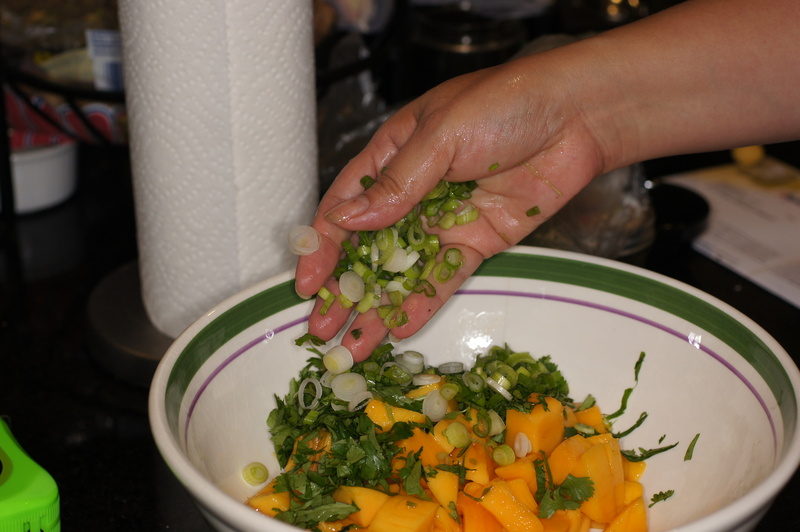 Keitts mangos are popular in Asian cultures, where they are enjoyed in its mature-green stage or even as pickles. They have a sweet and fruity flavor with a firm, juicy flesh with limited fibers and a dark to medium green color, sometimes with a pink blush over a small portion of the mango. When ripe the skin stays green even when ripe. To determine their ripeness squeeze gently. The peak availability for Keitt mangos is August and September with the primary source being Mexico and United States. Like the Haden mango, the Kent mango originated in Florida. 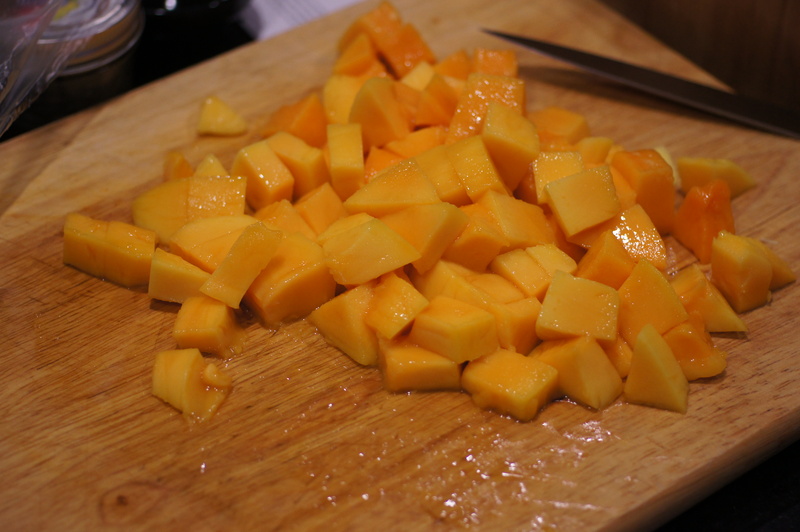 Kents are ideal mangos for juicing and drying. Now, their primary source is Mexico, Ecuador & Peru. Kent mangos have a sweet and rich flavor with a juicy, tender flesh with limited fibers and a dark green color that frequently has a dark red blush over a small portion of the mango. Their peak availability is January to March and June to August. This is what we used for this recipe because it is what was available in the stores. The Tommy Atkins mango is the most widely grown commercial variety coming into the United States. It is grown in Mexico, Guatemala, Brazil, Ecuador, and Peru. It has a mild, sweet flavor and firm flesh due to fibers throughout. It has a dark red blush color that often covers much of the fruit with green and orange-yellow accents. Judging ripeness is difficult based upon color so you must squeeze gently to judge ripeness. It peak availability is March to July and October to January. Get a fresh coconut and poke out eyes. 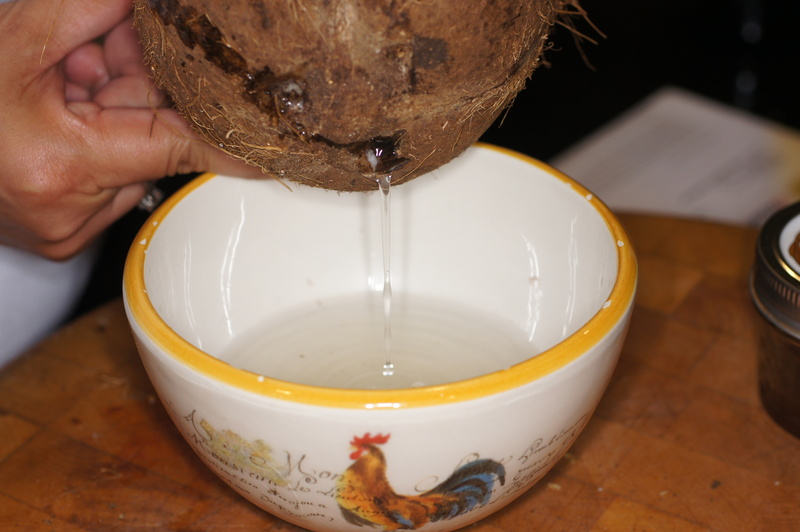 Pour coconut juice into a bowl and set aside. Place coconut into a plastic bag and throw onto driveway or other concrete surface to break it into manageable pieces to access the flesh. 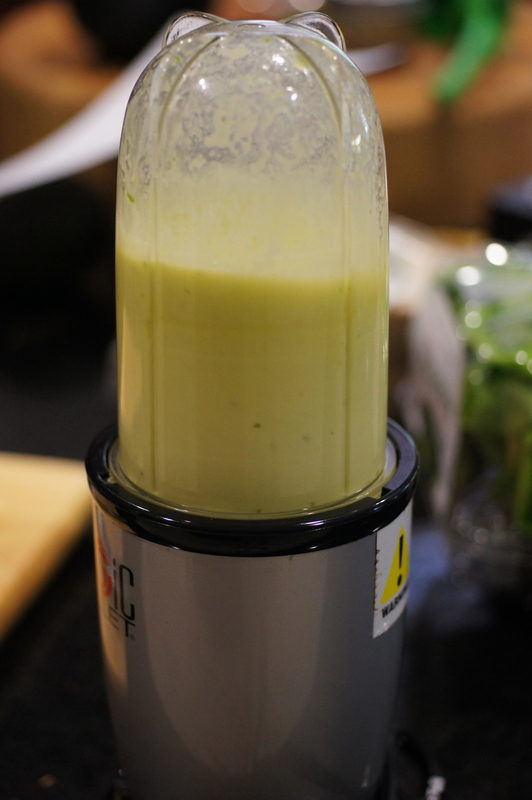 Place coconut juice, orange juice and zest,oil and salt into a blender and blend. Set aside. 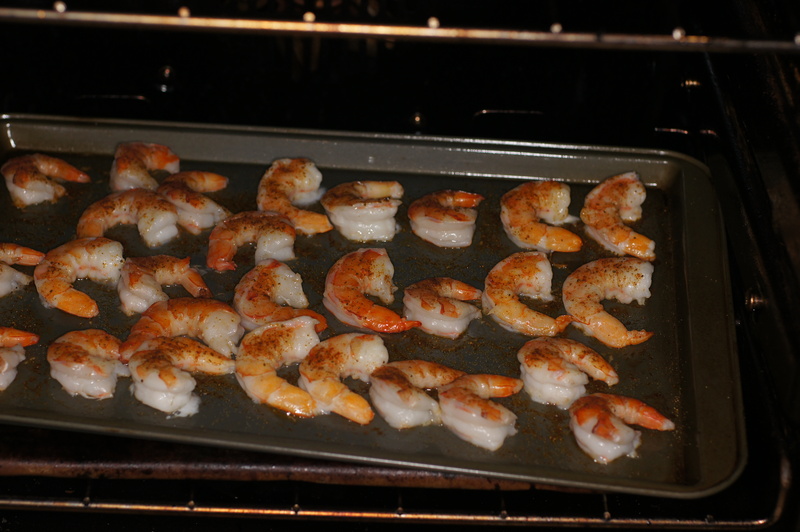 Season, peel and cook the shrimp in the oven at 350 F, roughly 4 minutes. Set aside to cool. 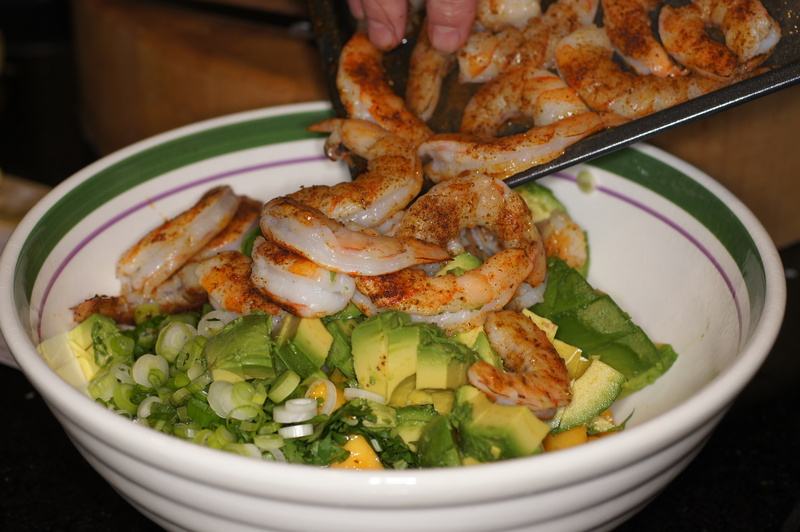 Remember that the residual heat of the shrimp and the pan will continue to cook the shrimp so it’s OK if the shrimp are slightly under done when you remove them from the oven. Their residual heat will cook them the rest of the way. 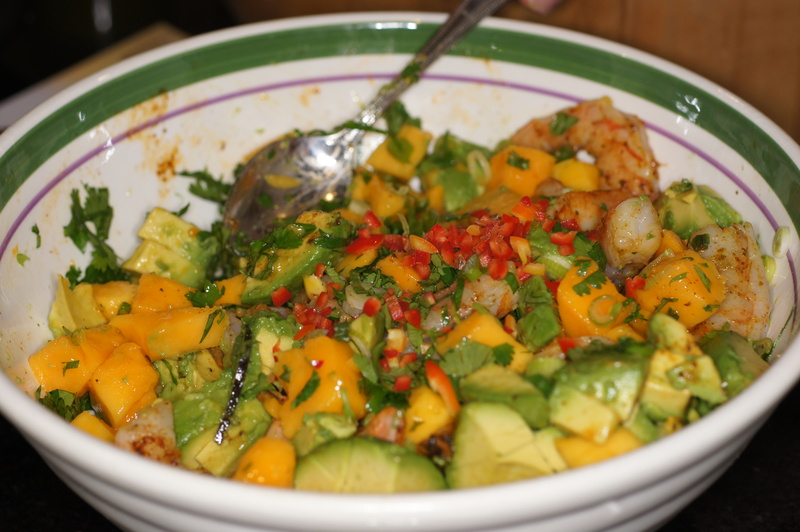 Dice the mango and place in a bowl. Add the chopped cilantro and sliced green onions. 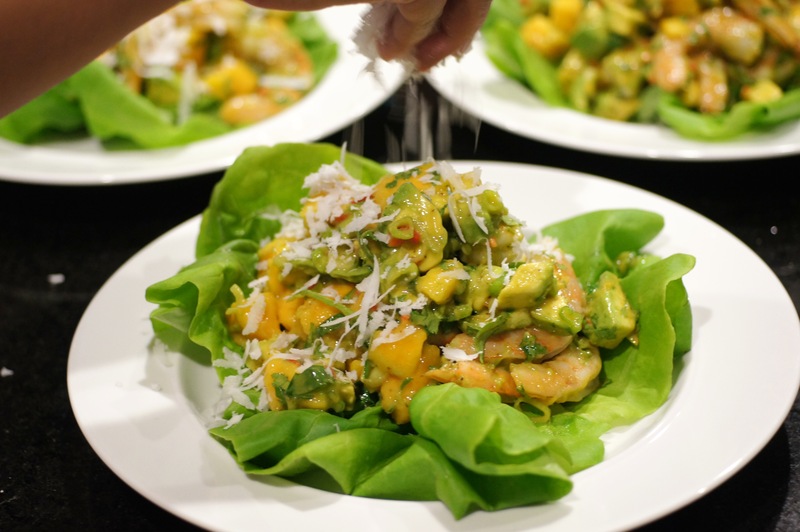 Toss gently one last time to fully incorporate all the ingredient and plate on a bed of Bibb lettuce. Top with freshly grated coconut. Enjoy! I love this! This is the second post I’ve seen this week using real coconuts! Love it! Thanks for your very nice compliment. I noticed you went to self hosting and followed you on Twitter. What made you decide to self host? 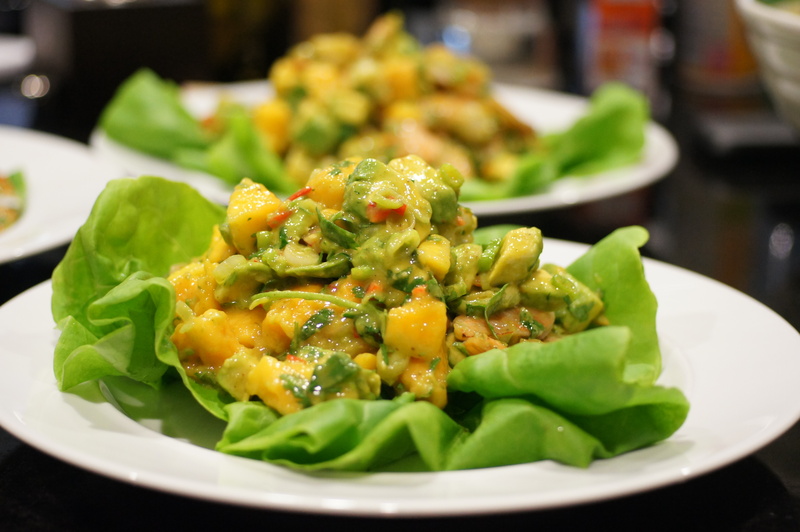 You must have a great palate .There are a lot of layered flavors in your salad .I love the tropical dish.When they say you eat with your eyes ,They were’nt lying.I’d eat that up in seconds. Thanks for your very nice comment. I’m glad you like the recipe and photos. “Marriage made in heaven” is right! A tropical heaven! This salad looks fantastic. All you need is an outdoor table, a sea-scented tropical breeze, and piña coladas. Mustn’t forget the cocktails! This sounds like a fantastic salad. Love the combination of tropical flavors. Thanks, Karen. It was a delightful salad, lite and bright. 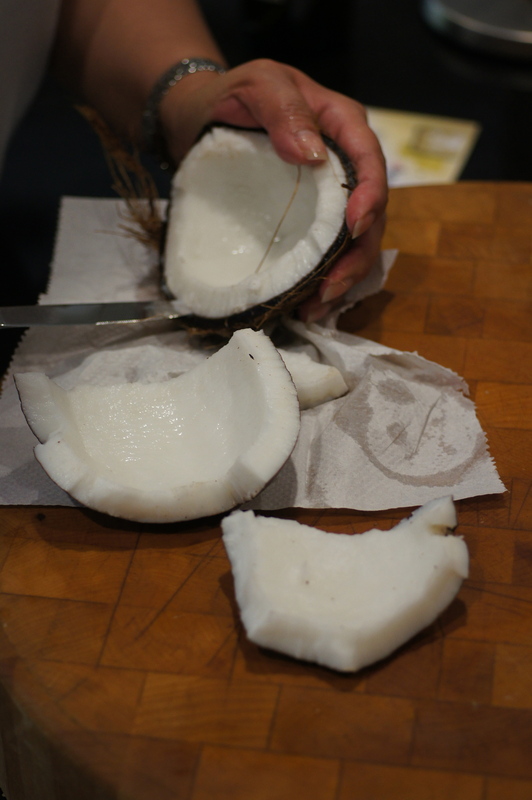 The coconut adds just a little texture in addition to the flavor.